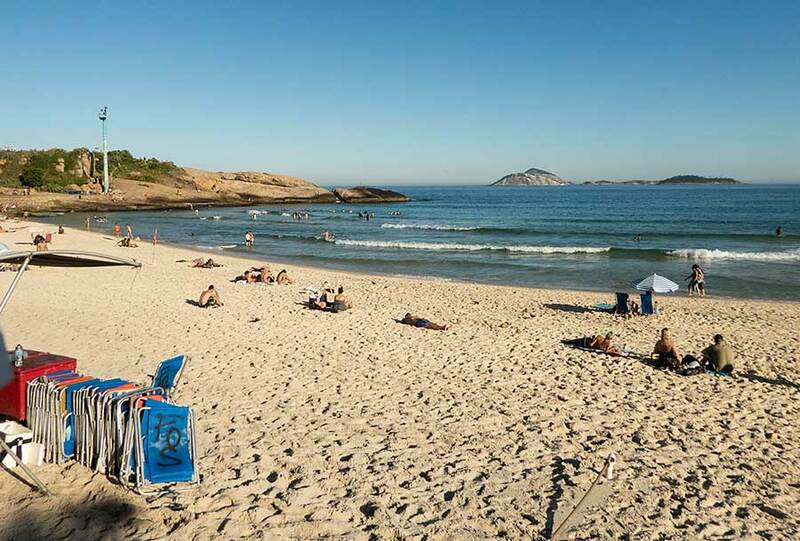 Before visiting Angra dos Reis we spent a couple of sunny days at nearby Ilha Gipoia. 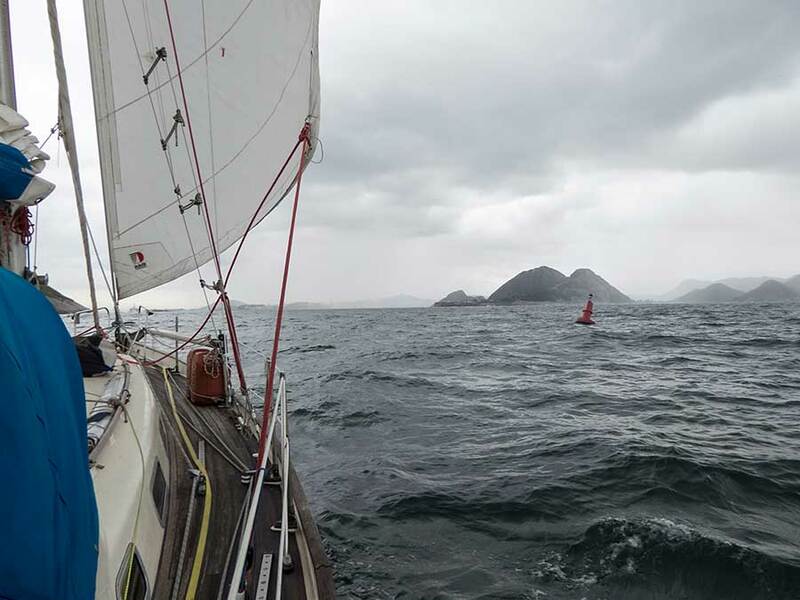 After a further day of rain and gusty winds we motored towards the port of Angra in overcast conditions, heading for the place we'd anchored last time. To our surprise there was a familiar-looking British yacht in 'our' spot. It turned out to be Pegasus, owned by Harvey, who we'd met briefly in Puerto Sauce. We anchored nearby and said quick "hellos" before taking the dinghy ashore to visit the authorities. Dealing with the authorities - immigration, customs and port captains - is always a worry for cruisers. 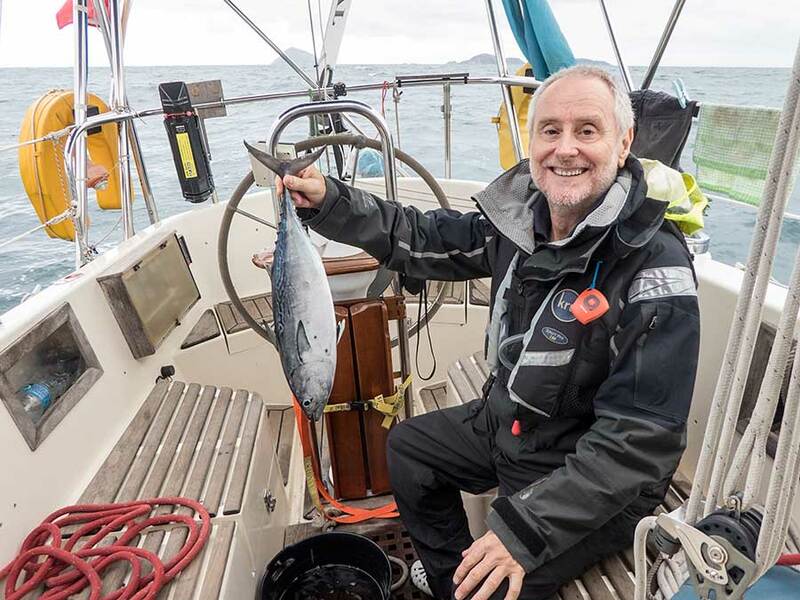 In some ports it can be difficult to find the right offices and people who know what to do with foreign yachts. But Angra has a reputation for being the most straight-forward place in Brazil for such matters, and so it turned out for us. In the Policia Federal an English-speaking special agent soon dealt with our visa renewals. He even offered us some paper charts, which had belonged to his father, so we came away with an armful of useful Caribbean charts as well. At customs we got a worried look from the smiling lady who spoke no English. We gathered that we didn't have all the right papers and she disappeared into a back office, soon to return with an English-speaker who explained that, under a recently introduced process, we had to go online and complete a form. He took us through the process of filling in the same form that visitors by air have to complete. Apart from the usual questions about money and goods of value, we had to declare Lynn Rival as baggage! Finally we visited the Captain of Ports for the usual in and out stamps. The whole process was completed in 3 hours so we considered ourselves fortunate. And, after a bit of shopping we should have been ready to move on but, as ever, we had a few more chores to do. One of our latest projects is to install a high capacity electric bilge pump - for emergency use. We'd established online that the chandlery in nearby Piratas marina could supply one, but did they have any hose? No. Instead we had to go to the town centre and hunt for something suitable. In the end we found a much more down-to-earth chandlery where we bought the hose and could also have bought a similar pump - probably much cheaper too, but we preferred not to ask! The other delay was to refill our empty gas bottles - a perennial quest for cruisers! We'd hoped the marina chandlery would help us, but were not surprised when they declined. Luckily we'd found somewhere in Angra last time so we returned there - a bit of a hike to the outskirts of town. The following afternoon our bottles were ready for collection and we took Harvey with us as well. He'd been trying in vain to find someone to 'bend' the rules for his refills! 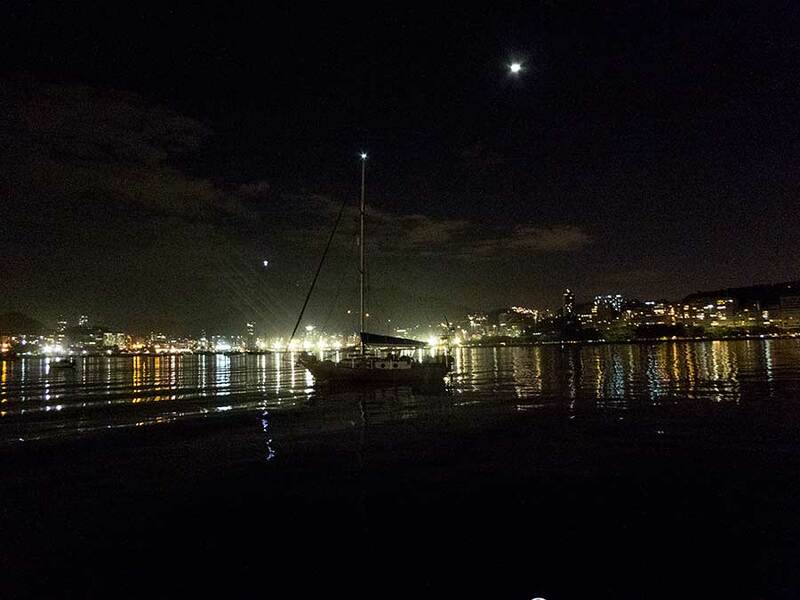 Two nights in Angra was more than enough. It's a useful place for getting things done but the anchorage smells of sewage, was often littered with dead fish and disturbed by many passing boats. We were also determined to leave in time to catch the next cold front coming over, bringing southerly winds to take us to Rio. We motored out in the late afternoon and anchored off two small islands, Ilhas Botinas, just 3 miles away, where the water is clear. The forecast showed the winds arriving at 10pm so after a swim and early supper we took a nap. By 8pm we were shaken out of our bunks by the strengthening wind and were soon speeding between various little islands and numerous fishing boats on our way out to sea. We didn't hoist the main and simply used the genoa. The wind was Force 5, gusting 6, and the dark skies were sometimes lit by lightning - typical of a cold front passing over. As we passed the eastern end of Ilha Grande the wind dropped for a while but soon returned, accompanied by rain. As usual Paul trolled our fishing line at dawn and this time was rewarded with a "little tunny", enough for two suppers. 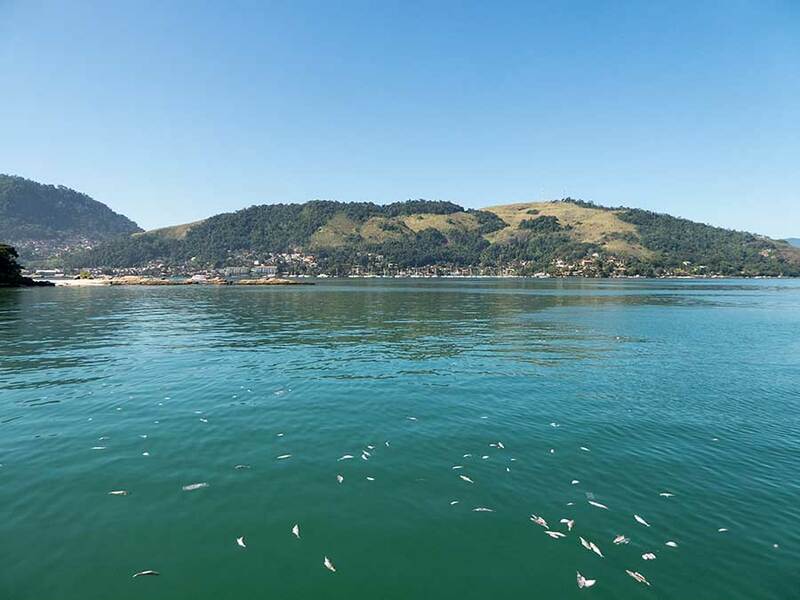 It was the first fish we'd caught since leaving Brazil in 2013 - not counting the one that jumped onto the pontoon and landed at our feet in Joinville! Ok that will feed two twice! It was a damp and often bouncy overnight sail. 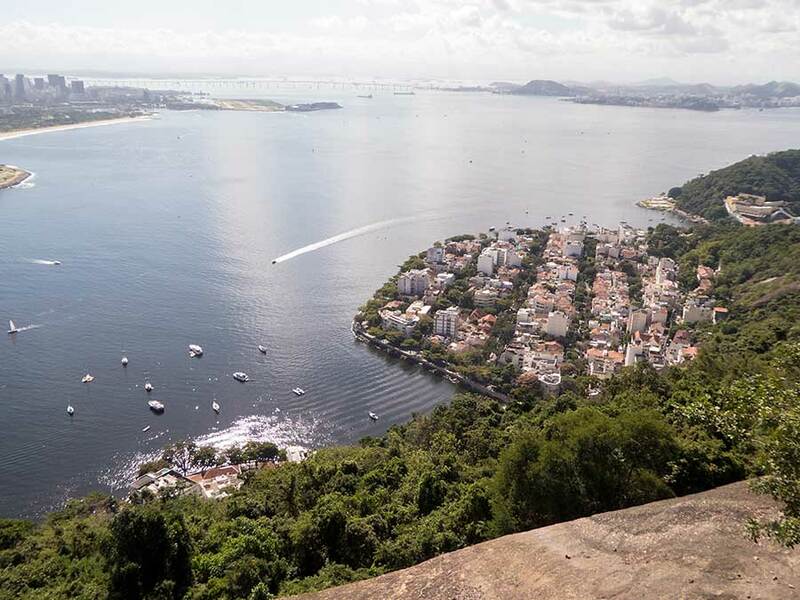 Sometimes the wind dropped, challenging us to put up the main, but generally we made good progress through the night and by dawn we could see the Corcovado, the Sugar Loaf mountain and the entrance to Guanabara Bay. 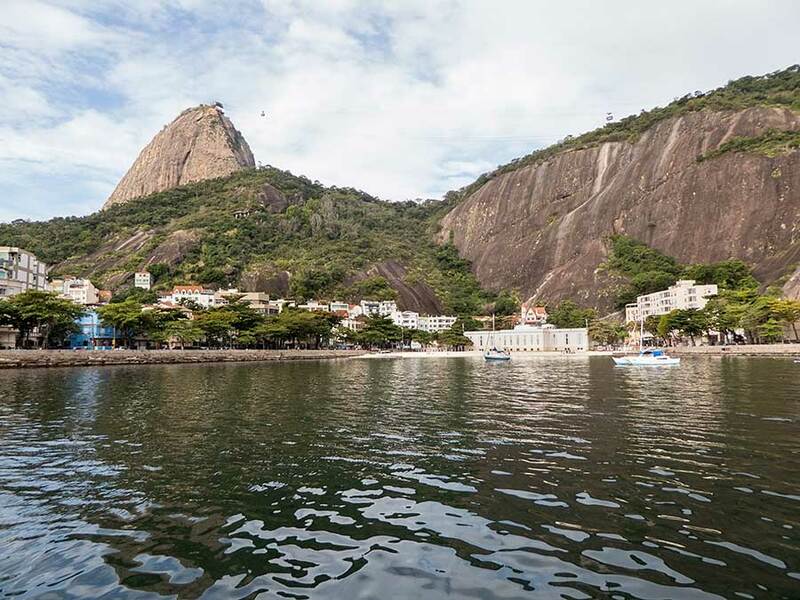 By mid-morning we were inside Guanabara Bay and anchored under the Sugar Loaf mountain off the Fortaleza Sao Joao. And for the rest of the day our excitement at returning to the Cidade Maravilhosa was subdued by the need to catch up on our sleep. The next day was Saturday so we went ashore to meet a local sailor, Fernando, who lives close by. Unfortunately the beach at Fortaleza Sao Joao is controlled by the military and the only place to land the dinghy is a small and busy pier. 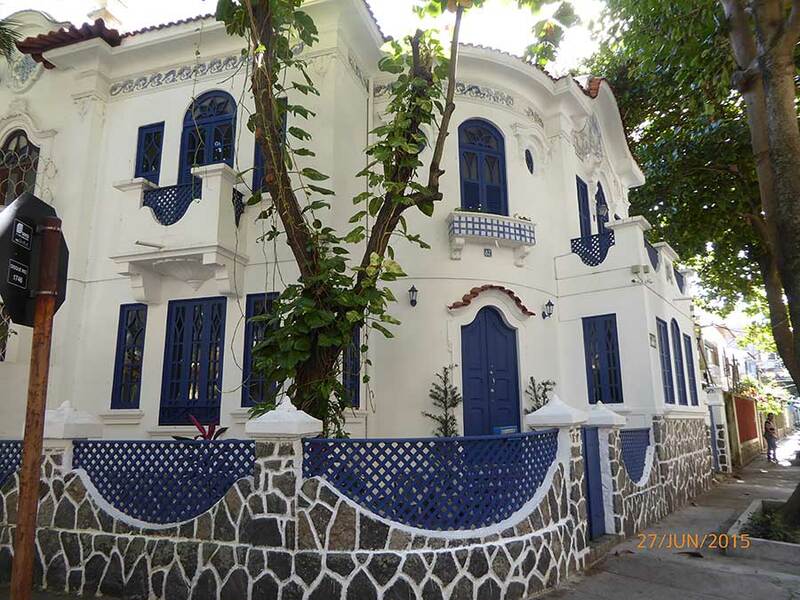 We walked through Urca, a leafy residential district reminiscent of some parts of Paris - including the dog mess. Not far away we came to a small public beach where we noticed yachts anchored off. We soon realised that this must be where some of our cruising friends had visited and reported being able to leave their dinghy on the beach! The weekend went by in a flash. On Saturday evening Fernando took us to a music studio where a group of his friends were having a session. They started a band in their youth and are still getting together - just for fun - in their 60s. The music was just about recognisable including "The girl from Ipanema", and 1970s hits, finishing with an appropriately excruciating rendition of "Hotel California". 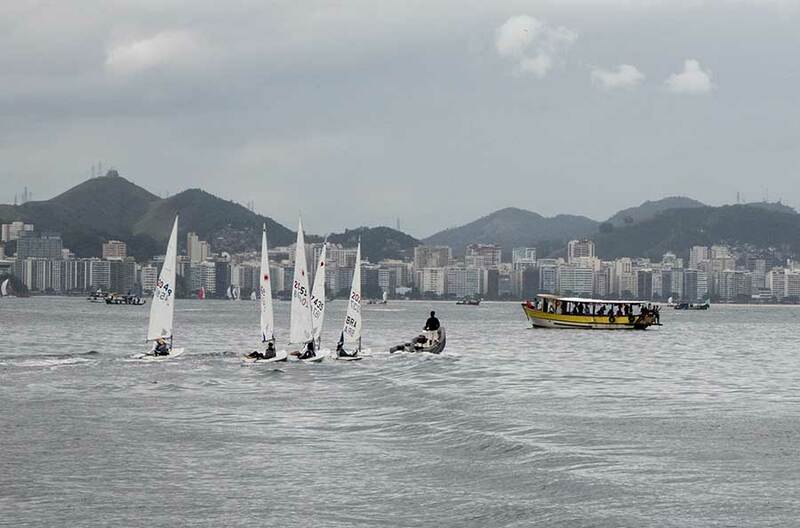 On Sunday morning we upped anchor and moved the half mile to Urca beach. It was low tide and springs, so we approached cautiously because our navigation charts show the depths shallowing to not much over our draft. In fact we found the depths to be greater than charted and found a convenient spot to drop the hook in 6 metres. From here it's easy to row ashore, safe to leave the dinghy (padlocked to a water main) and there's a well-stocked supermarket just over the road. And, Fernando has kindly invited us to visit for showers and use of a washing machine so what more can we want? In the afternoon, Fernando's friend Freddy cooked on the BBQ for about 10 of us. Not only Fernando - who lived and worked in the UK during the 1970s - but almost everyone spoke English, so we didn't have to struggle with Portuguese. 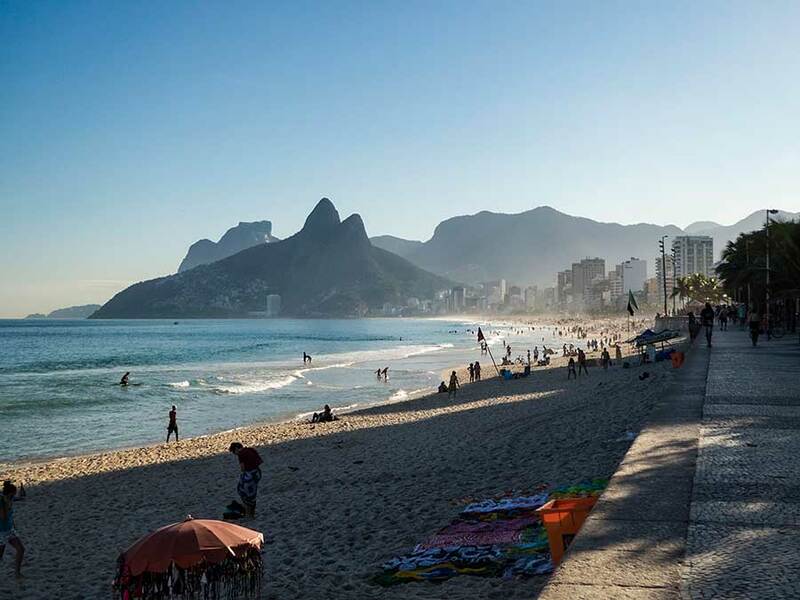 Rio is of course a big, cosmopolitan city so we shouldn't be so surprised but we're still getting used to being here again! We'd arranged to meet Peter and Halina on Tuesday. They live to the west of Rio so we met at Ipanema - for us a short journey by bus and metro. We first met them in Bahia while they were on holiday in Campinho. Peter has recently had not just one, but two shoulder operations so he and Rachel have a common understanding of the pain involved in recovery! 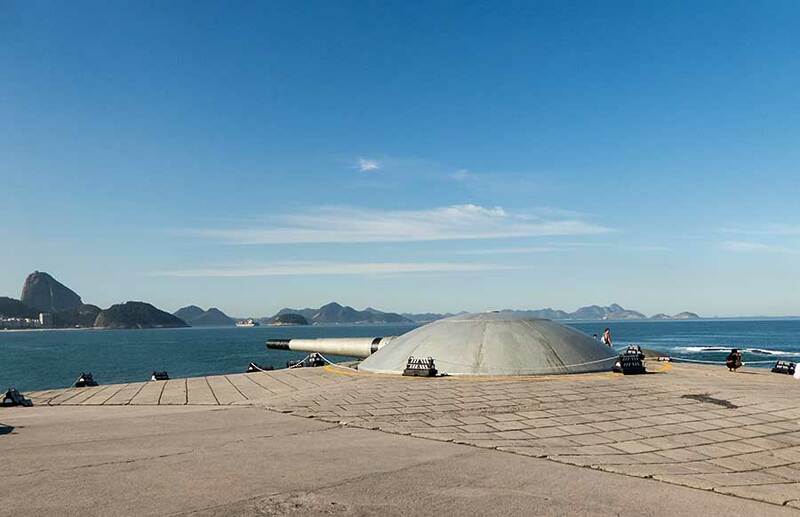 We had lunch at the Forte de Copacabana - a surprisingly tranquil place as well as affording great views of the coast. 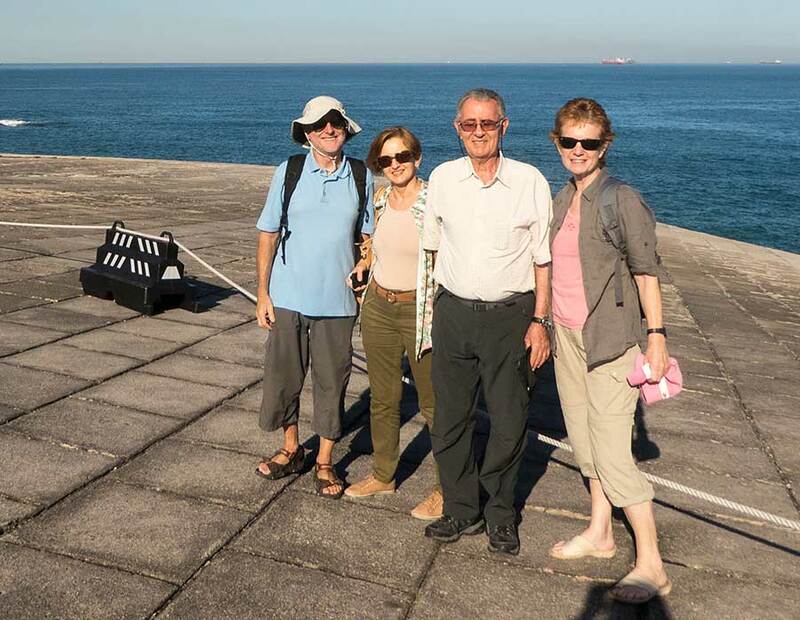 Afterwards we walked around the nearby rocks called Pedra do Arpoador - another good viewing spot. It was fortunate that we didn't have anything planned for Wednesday. It was windy and wet. If we'd been ready to go we would have left on Tuesday afternoon to take advantage of the southerly winds. As it was we had to sit out the winds which were blowing around the Sugar Loaf and into our anchorage, making it quite uncomfortable at times. We let out plenty of scope and our anchor held well but it's always worrying when close to the shore and other boats. After a day the winds settled down to the normal light easterlies. 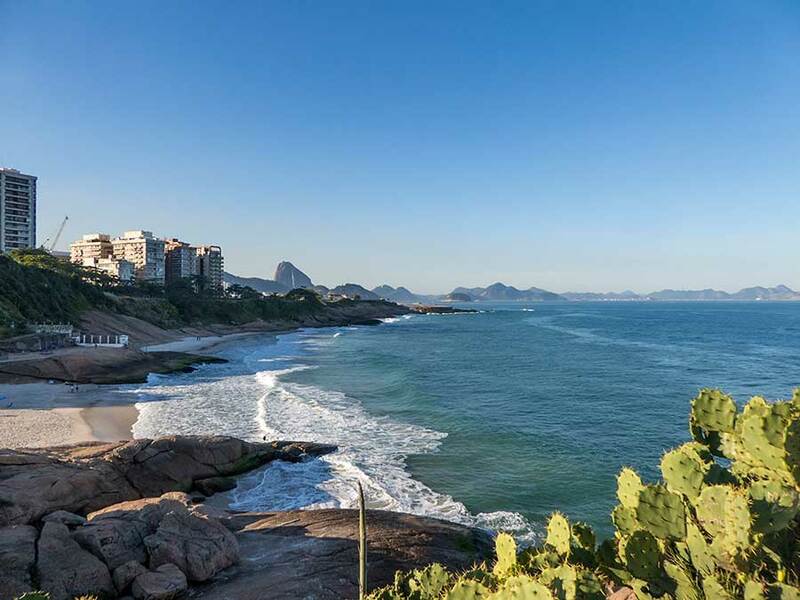 We are enjoying being in Rio for a few more days and plan to visit Niteroi across the bay before we leave ahead of the next lot of southerly winds.